Honda's first labor disruption in China may threaten deliveries to dealerships, including this one in Shenzhen. TOKYO (Bloomberg) -- Honda Motor Co. shut down all four of its car plants in China after 1,850 workers at a partsmaking unit went on strike demanding a pay raise, crippling production in the world’s biggest auto market. 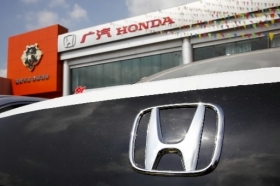 Honda, Japan’s second-biggest carmaker, closed two plants in Guangzhou, Guangdong province on May 24 and factories in Guangzhou and Wuhan, Hubei province, on May 26, Tomoko Uchida, a spokeswoman for the Tokyo-based company, said by phone Thursday. Workers making transmissions and engine parts at Honda Auto Parts Manufacturing Co. in Foshan, Guangdong, went on strike May 17, said Zhu Linjie, a Beijing-based spokesman for the carmaker. While labor unrest has increased in China, Yasuko Matsuura, a Tokyo-based spokeswoman for the carmaker, said the walkout is the first to affect Honda’s production there. Honda, worker representatives and local government officials in Foshan will continue talks to end the strike, the company said. “China is experiencing a labor shortage that’s shifting the natural bargaining power to workers,” said Chang-Hee Lee, a Beijing-based industrial relations specialist at the International Labor Organization. Honda will halt production at least until May 29 and plans to make a decision Friday about next’s week output, Honda’s Matsuura said. The company isn’t disclosing how many vehicles have been affected. The employees at the parts plant are demanding monthly pay be boosted to between 2,000 yuan ($293) and 2,500 yuan, from 1,500 yuan, Matsuura said. The workers are requesting they be paid about the same as those at Honda’s carmaking factories in China, the company said. Honda rose 1.2 percent to 2,771 yen in Tokyo, in line with the benchmark Nikkei 225 Stock Average. Toyota Motor Corp., the world’s biggest carmaker, and Nissan Motor Co. also have plants in Guangdong province. The companies have no labor problems at plants there, they said. Honda’s sales in China accounted for 17 percent of its global sales last year, the carmaker said. The company’s namesake brand ranked fifth in China by unit sales last month, according to J.D. Power & Associates. Honda may increase China sales 9 percent this year to 630,000 vehicles, CEO Takanobu Ito said last month. Local government officials in Foshan City’s Shishan county are involved in the talks between workers and the automaker, Honda’s Zhu said. The local government issued a statement a few days ago that said that Honda hadn’t violated China’s rules on workers’ compensation or their working environment, he said. The strike is continuing and the workers union is complying with labor laws and regulations, its chairman, who identified himself only by his surname, Wu, said when reached by phone today. He declined to comment further. “Japanese companies in China tend to provide better treatment than local companies that have no affiliation with foreign companies,” said Satoshi Yuzaki, an auto analyst at Takagi Securities Co. in Tokyo. Trade unions and employers appear to be reporting a growing number of strikes in China, although there are no official numbers, said the International Labor Organization’s Lee, who has covered the nation’s industrial labor relations since 2000. Honda’s strike isn’t the first for Japanese companies in China, he said. Several thousand Chinese workers at Japanese companies including Toshiba Corp. and Canon Inc. went on strike in 2005 in Dalian, a city on the northeast coast of China, demanding higher pay or better working conditions, Lee said. Two years ago, taxi drivers also refused to work in Chinese cities Chongqing and Shanghai, complaining about competition from unlicensed drivers, he said. More than 90 percent of companies based in China’s Pearl River Delta region, which includes Guangzhou, reported labor shortages, adding up to about 2 million workers, China’s Southern Metropolis Daily reported in February. Honda plans to raise production capacity in China by 28 percent to 830,000 vehicles a year by the second half of 2012 from 650,000 and introduce two new models as car demand grows in the country, Honda’s Ito said in Guangzhou this week. China’s vehicle sales may rise 17 percent this year to 16 million as annual demand for automobiles may eventually exceed 30 million, an official at the State Information Center said.